Over the past week we have discussed just how important your posture is lying down as it is standing up! Our final topic in terms of correct sleeping positions is your pillow! Bend your head to the left… now imagine lying down with your head bent like that for 7-9 hours. Your pillow may be either too low or too high. It is all about the neutral alignment of YOUR spine! The size of the pillow depends on how much space there is to fill between your head and the mattress. If you are a side sleeper you will need a thicker pillow then a back sleeper, as there is more space to fill. For back sleepers, if the pillow is too thick it will cause your head to be in forward flexion and if the pillow is too thin it will cause extension of your head. If you think your pillow is to low, try this. Grab a bath towel and fold it into thirds. Place the folded towel horizontally under your pillow, closest to your shoulders not the top of the head, for the back sleepers. This is because when we lie on our backs the furthest distance to the mattress is your neck not the top of your head. It’s all about the distance of your neutral spine from the mattress! Again… Try avoiding sleeping on your stomach (as we have discussed in our previous posts). If this is something you are struggling with try this: Roll up a sock and put it in your pyjama pocket on your shirt. Start the night off on your back or side and if you turn to your stomach in the night time it will wake you up and begin to break your pattern! Your pillows should be changed every 2 years. 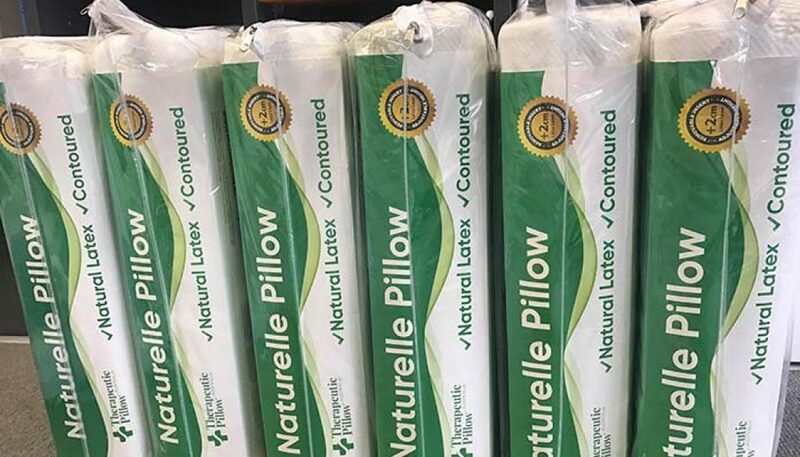 At Unwind we recommend natural latex as it is much more breathable and supports you 100% of the time, plus it is a natural product! These pillows come in 3 different sizes to suit everyone. Come into Unwind and we will happily fit you with the correct pillow. Get someone to take a photo when you are sleeping and bring it in to Unwind and we will happily discuss your pillow and sleeping positions with you! Next on the agenda: food for sleep!